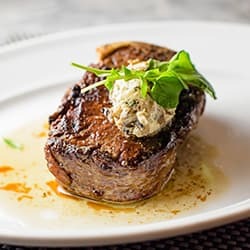 Mason Street Grill in downtown Milwaukee, is a classic American Grill serving high-quality wood grilled steaks, delectable seafood dishes, and thoughtfully prepared entrees for both lunch and dinner. As one of the classic 'Milwaukee gems' in the downtown area, guests can enjoy a warm atmosphere, top-notch service, and consistently delicious food. We've got one of the best 'Happy Hours' in the city and live music six days a week. At our steak restaurant in Milwaukee, you’re invited to settle in and stay for a while. No matter the occasion, Mason Street Grill is happy to customize your next gathering. From intimate parties of eight to business functions of up to 60, we offer three private dining rooms with flexible space for groups of all sizes. With our downtown Milwaukee location and Pfister hotel amenities, our steak restaurant is a great meeting, event, or celebration location!